What to be for Halloween was the question on my mind. Browsing threw online sites of the same costumes for hours and I eventually gave up. Thought to myself what is the coolest most original scary movie character? Pinhead! So I looked online at pictures of a pinhead costume to create myself. I took nails, cut the tips off, sanded them smooth and crazy glued the nails to tiny pieces of rubber I cut up from a fake witch nose. Glued the nails to my head using latex glue and the rest was simple. 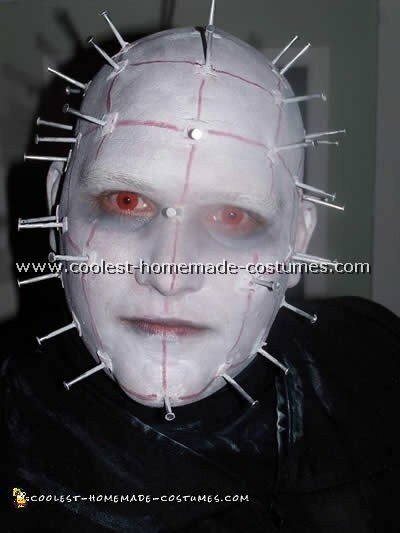 This pinhead costume was a hit at the party and won three prizes. 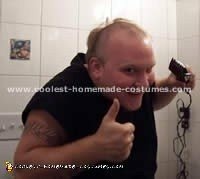 By the way, I had to shave my head. Costume by Ron W., Vancouver, B.C. My girlfriend Roxy came up with this idea. This costume was made up of spray paint, skewers, bald cap, black paint, white paint, fake nails, black jacket and a black ripped up dress. Oh! With a spot of red in there (as well as the sword as a hand). I was a celebrity in this costume, people on the streets were asking to take pictures with me and it was awesome!! !